Today GIGABYTE Server (the server arm of GIGABYTE, a different BU to the motherboard team) has lifted the lid on their new MA10-ST0 motherboard and SoC combination, aimed squarely at the cold storage or edge storage market. This includes base support for up to 16 SATA drives via SFF8087, a PCIe x8 slot, 10 gigabit Ethernet via two SFP+ ports, and server management features via the Aspeed AST2400. For server/enterprise features, a TPM header and a COM header are also present. The interesting twist in this tale, however, is the SoC at the heart of the unit. GIGABYTE Server has announced they are using the C3958 SoC, listed as a 16-core part at 31W TDP and supporting DDR4-2400. The C3000 series is known as the Denverton family of CPUs, based on Intel’s Goldmont Atom microarchitecture. The Denverton CPU family has been formally announced, although only as a single SKU, the dual core C3338, which is present in some enterprise NAS devices. Some others have cited cloud instances featuring unannounced Denverton CPUs being deployed and available by cloud providers. This C3958 is another unannounced processor from Intel. Intel’s Atom line in this market is still recovering from the Avoton/Rangeley issue that cropped up 18-24 months after launch, which had an outside chance of burning out the signal generator resulting in a system that would be unable to be repaired (we are told that an unusual spike in failures is not expected from this, but for users who deploy 10-15 year embedded devices it might be in the back of their minds). From this, Intel released a new stepping of the CPU to address the bug, and some have predicted that the delays to the formal announcement and release of the Denverton stack (some 12 months or more after the expected announcement date) is due to ensuring Denverton does not have this issue. 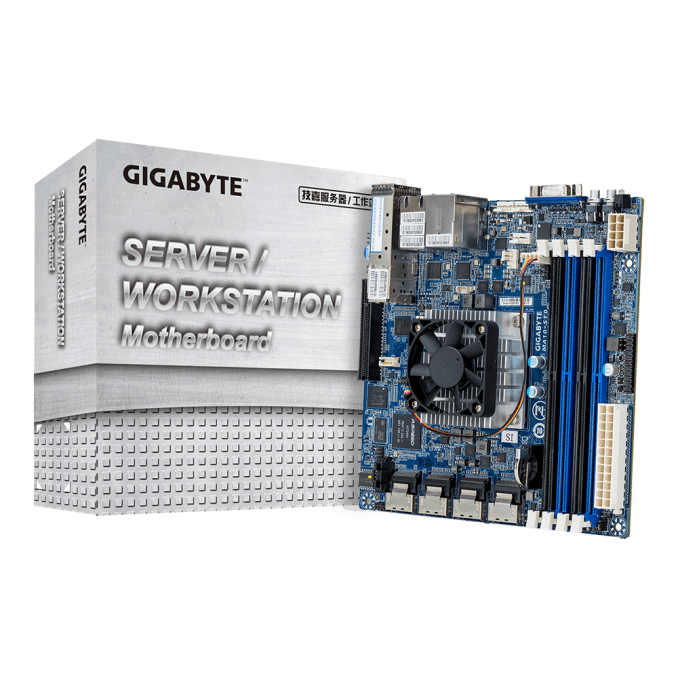 As for the C3958, GIGABYTE Server lists this as Intel’s top Denverton SoC model, running at 16 cores, 1MB of L2 per core, 2.0 GHz base frequency (no word on turbo), support for up to 128GB of DDR4-2400 RDIMMs (or 64GB of UDIMMs, i.e. 4x16GB modules) and having a 31W TDP. Typically around this SoC level, we might expect to compare it to an E3-1200 v6 series processor, although those CPUs start at 72W. The previous generation Rangeley processor topped out at 8 cores and 2.4 GHz for 20W, so on paper there looks to be some efficiency gain despite the frequency decrease. 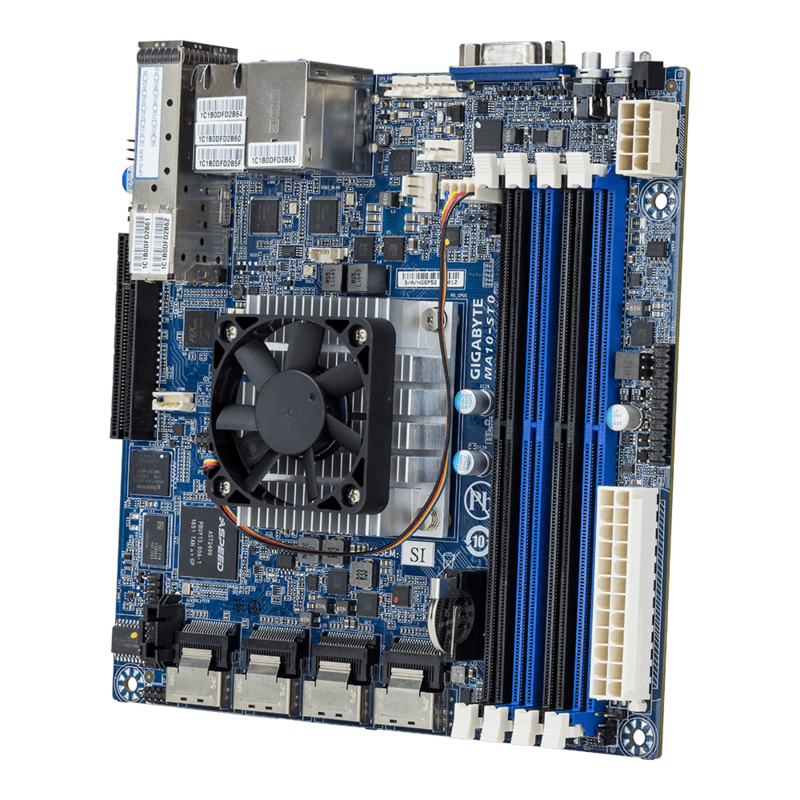 As for the MA10-ST0 motherboard, along with all the features above it also comes with 32GB of eMMC flash, allowing a user to install a storage-based OS for a network deployment without using any of the onboard SATA ports. 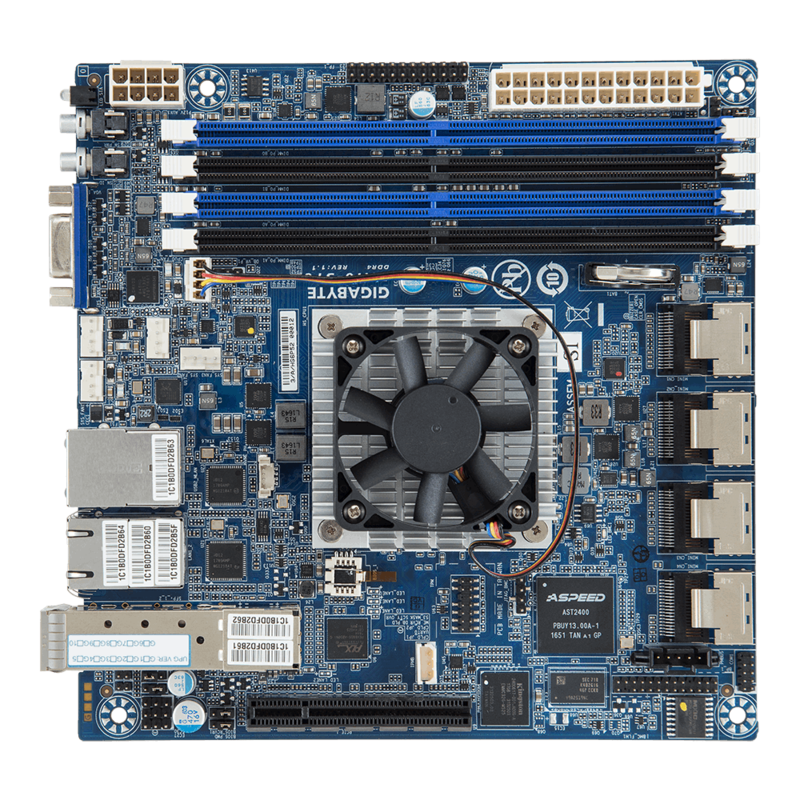 GIGABYTE Server has told us that board is essentially ready to go, and interested parties should get in contact with their local reps. The C3338 which is the smaller version of the chip that's already on the market has official ECC support. Ian, Denverton is already "announced". So how much of my money do they have to shut up and take? "This C3958 is another unannounced processor from Intel."